WASHINGTON (NASA PR) — NASA will host a media teleconference at 1 p.m. EST Thursday, Nov. 8, to discuss select science investigations and technology demonstrations launching on the next Northrop Grumman commercial resupply flight to the International Space Station. Audio of the teleconference will stream live on NASA’s website. 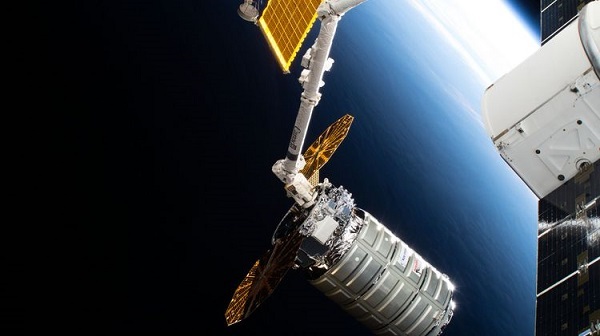 Tara Ruttley, associate chief scientist for Microgravity Research in NASA’s Office of Chief Scientist, and Liz Warren, associate program scientist for the station’s National Lab, will provide an overview of the research and technology aboard Northrop Grumman’s Cygnus spacecraft. Laurence Harris is a professor at York University in Toronto and principle investigator for research to develop, in collaboration with the Canadian Space Agency, a mathematical model for how an astronaut’s perception of motion, body position and distance to objects changes in space. Marco Baptista with the Michael J. Fox Foundation in New York is the principle investigator for a National Lab investigation to evaluate growth of protein crystals implicated in Parkinson’s disease. Crystals grown in space are larger, enabling more detailed analysis to help define the protein’s exact shape and morphology and help scientists better understand the disease’s pathology. Negar Rajabiat Cemscia, LLC, is principle investigator for National Lab research to test a novel approach of using particles of calcium-silicate to synthesize membranes as thin as a human hair. These particles can separate carbon dioxide molecules from air or other gases, technology that could aid in removing carbon dioxide from waste gases to reduce greenhouse gas emissions. Tamara Koch, David Merges and Dominik Spahr, principle and co-principle investigators at Goethe University in Frankfurt, Germany, will discuss a National Lab investigation focused on astrophysics research to examine the formation of chondrules, some of the oldest material in the solar system. With the House majority going to the Democrats, maybe there will be more Reps. being science lovers and back these people. I will complain to the Science Committee about NASA dropping Soyuz rocket parts on poor people for about 30 years. I think Democrats have sympathy, empathy for poor people. Also scruples. I will ask if they are going to keep the coverup of these atrocities going. NASA has said they will keep using Soyuz on direct swap to ferry crew to ISS. Each booster weighs 8000lbs and the core weighs 12000lbs. Parachutes could be used to give local police time to warn anybody. Pretty heavy and bulky, so flight controls using GPS could turn the boosters to a safe area if needed. Maybe skids to land on. Musk said everyone should use reuse so he would not object. Russia might be able to reuse these boosters, but that might cost jobs. So they can not do it. They say they will have reuse in 10 years. Here is away to do it now. Go Democrats!